During the LSU-Rice semifinal game of the NCAA Baton Rouge baseball regional in 2016, the Twitter universe flashed some buzz regarding the play-by-play broadcaster for the game that was broadcast on ESPNU. “Who’s the play-by-play guy in Baton Rouge? What a classic baseball voice,” tweeted Aaron Fitt, a national writer and editor at D1Baseball.com. 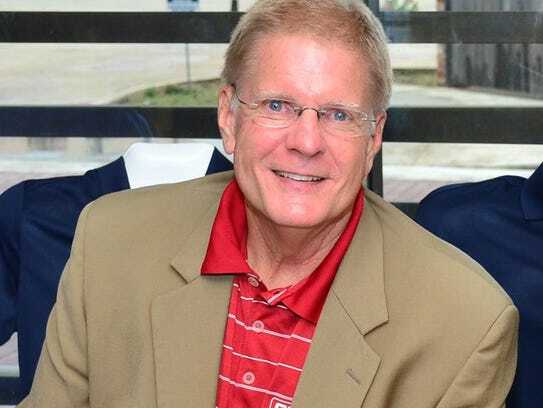 A native Alexandrian and resident of Pineville, Rollins is being inducted into the Louisiana Sports Hall of Fame on June 30 in Natchitoches as a broadcasting winner of the Louisiana Sports Writers Association’s Distinguished Service Award in Sports Journalism. It’s a career he felt called to as a child. Most of those nights beside the radio, though, young Lyn was listening to St. Louis Cardinals baseball games on KMOX-AM, “the Voice of St. Louis,” and future National Baseball Hall of Famer Jack Buck was the announcer. Rollins got his start in broadcasting as a freshman at Northwestern State University in Natchitoches, working at KNOC, sweeping the lobby, emptying trash cans and doing other odd jobs. A 1973 NSU journalism graduate, Rollins is a four-time Louisiana Sportscaster of the Year (selected by peers in broadcast and print journalism). For a few decades, he was Alexandria’s premier play-by-play broadcaster in high school sports, especially football, and he was the Voice of the Alexandria Aces minor league baseball team over two spans of the team’s existence, both in the Texas League in the ’70s and in independent leagues in the ’90s and early ’00s. Through those years, he found a groove for calling baseball. It also provided a bridge to his broadcasting future, thanks to Ronnie Rantz, a former star athlete for Holy Savior Menard who pitched at LSU under Skip Bertman and played briefly for the Aces in 1995. “In the fall of ’97, I started putting together the Jumbo Sports Network,” said Rantz, the chief executive officer and president of the Louisiana Sports Hall of Fame. “I wanted to set a pretty high bar. I needed a play-by-play guy, and the usual suspects like Jim Henderson (Saints) and Jim Hawthorne (LSU) were taken. This was 20 years ago, a different landscape for sports TV with not as many options as you have now. Rollins, who has a master’s in journalism from LSU, was the primary play-by-play man for Jumbo Sports’ groundbreaking baseball telecasts at LSU and other state schools. Rollins and Rantz did the broadcasts for the 2001 NCAA Super Regional baseball series between LSU and Tulane at Zephyr Field in Metairie in what would be Skip Bertman’s farewell as LSU’s legendary baseball coach. Rollins seemingly hit full stride during those broadcasts when, because of the size of the audience, thousands of fans in the state were introduced to the broadcaster who graduated from Bolton High School in 1968 and worked for one year as a sportswriter for the Town Talk in ’76-77. “Lyn knows baseball — he played it, called it (as an official), gets the nuances of it,” said Rantz. “He has some quirky lines — ‘hotter than a Rolex in a pawn shop’ is my personal favorite." Northwestern State fans came to know Rollins as the Demon Sports Network play-by-play man from 1993-2003. Last fall, during an NSU football game broadcast on Cox Sports Television, NSU president Chris Maggio presented Rollins the university’s prestigious Nth Degree during a surprise halftime visit. “Lyn has risen to the highest levels in his profession,” said Maggio at the time. Jeff Brenner, the executive producer of Cox Sports Television, hired Rollins in 2003 as part of a collaborative effort between LSU and CST to televise LSU sports events. “He reached out to us about doing some work,” said Brenner. “Knowing how much history he had in the state … we needed someone who could bring that out in a broadcast. Lyn is very professional, he cares about his broadcasts and about the kids he’s broadcasting about. He’s never put a kid down because he knows they are still students. Rollins has made the drive from Pineville to Baton Rouge more than 1,000 times since 2003. Kevin Wagner, who oversees LSU’s responsibilities with the SEC Network as LSU’s assistant athletic director for network operations, hired Rollins four years ago to be LSU’s lead announcer in SEC/ESPN network events. Ben McDonald, a Louisiana Sports Hall of Famer as a former LSU and major league pitcher, has done many baseball broadcasts with Rollins and has won acclaim nationally for his insight and style as a studio or broadcast booth analyst for college baseball. “I got into broadcasting kind of by accident,” said McDonald. “Lyn taught me more about broadcasting just by doing games with him and listening to him. He’s responsible in a lot of ways for me getting to where I am. “I’ve never met someone who has done so many sports (as a broadcaster),” said Brenner. “He’s willing to drive to maybe Ole Miss or Mississippi State for a football game and then cover a soccer match or a softball game on campus, sometimes when no flights are available. Athletic Network Footnote by Dr. Ed Dugas. Congratulations to Lyn on this well-deserved recognition. Lyn Rollins has broadcast UL football, baseball and softball. His softball broadcast partner is often former Cajun coach Yvette Girauard and they are an awesome team.